More information about the R1200GS is below in BMW's official press release. The world's most successful travel enduro is perfected. The "BMW GS" concept has embodied riding pleasure and the desire for adventure for over 30 years. This applies especially to the GS motorcycles with the opposed-twin "boxer" engine. The "big GS" allows motorcyclists to explore the most remote corners of the world—an idea that has already inspired numerous globetrotters to set off on their travels. But the GS was and still is much more than this. Whether sports-style cornering on winding country roads, excellent travel times due to high motorway speeds, relaxed tours with a passenger or daring rides over rough terrain—every GS has offered supreme mastery of these skills in its respective era and this won't change with the new version. It is the unique integrated concept of the big travel enduro bike with boxer engine, complete with authentic charm and a powerful, high-torque engine, which is loved by legions of motorcycle fans all over the world to this day. It is not for nothing that the "big BMW GS" with boxer engine has been the undisputed frontrunner in its market segment for many years and is the best-seller within the BMW Motorrad model range. BMW is now beginning a whole new chapter in GS history: the most popular travel enduro in the world has been brought to perfection. Even in its ninth year of production, the current BMW R 1200 GS is still setting the benchmark in its segment in comparative tests with its outstanding overall concept and innovative technology. With over 170,000 units sold, it is the most successful and top-selling travel enduro in the world. So the challenge facing the BMW Motorrad development department was considerable: to further optimise the GS—an icon of three decades—improve it in all areas and equip it with innovative technical solutions to ensure it is in good shape for the future. Further increase performance overall—without neglecting its well-established virtues. Newly designed air/water-cooled boxer engine with vertical through-flow, integrated gearbox and left-hand cardan shaft drive. 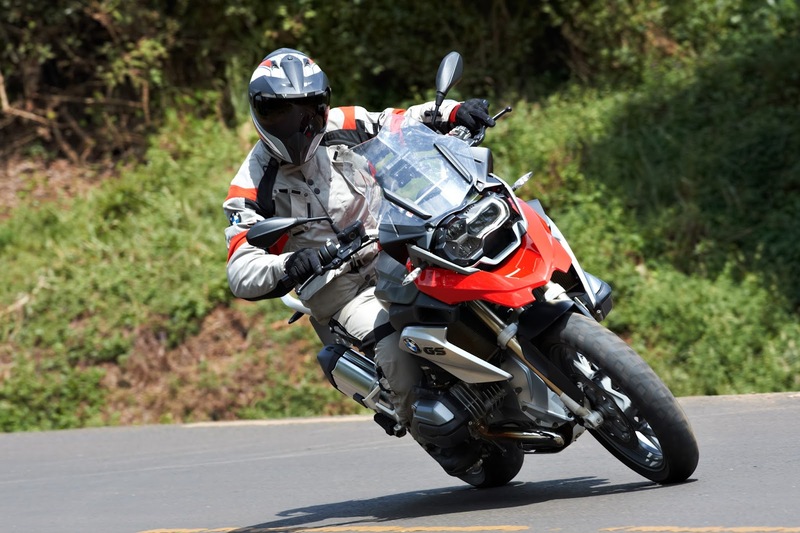 Geared towards the above goals, the entire R 1200 GS was completely redefined, particularly the drive concept. The performance aspired to, as well as adherence to future anticipated requirements in terms of noise and exhaust emissions, is ensured among other things by a change in the cooling system. The boxer engine in the new R 1200 GS continues to use air/liquid cooling, however, the coolant oil has been replaced by a glycol-water mixture. This ensures a high level of heat absorption capacity of the cooling liquid for more efficient heat dissipation. So-called precision cooling (a principle similar to that used in Formula 1) involves only those engine elements being cooled with coolant, which are particularly exposed to thermal stress. The engine still continues to use air cooling, thereby preserving the characteristic appearance of the opposed twin boxer engine. The two radiators are small and inconspicuously integrated. The through-flow is now vertical instead of horizontal for improved filling, and the engine housing integrates the 6-speed gearbox as well as a wet clutch with anti-hopping function instead of the dry clutch as was used previously. What is more, the secondary drive now runs via the well-established cardan shaft on the left-hand side. With an output of 92 kW (125 bhp) at 7700 rpm and 125 Nm at 6500 rpm, the new engine offers superior power and performance in the travel enduro segment and beyond. An electromotive throttle actuator is now used for the first time in a GS motorcycle. Here, rider commands are passed on directly by the sensor in the accelerator twist grip to the engine control system; this then regulates the throttle valve electronically. The use of the E-gas system provides a significant improvement in terms of controllability and response. What is more, the rider can adapt engine characteristics to the situation on the road by means of five modes (optional extra). It was also possible to include an electronic cruise control function (optional extra). ASC and riding modes as an optional extra: five freely selectable modes—"Rain", "Road", "Dynamic", "Enduro" and "Enduro Pro". For optimum adaptation to the rider's individual needs and purpose, the new R 1200 GS now offers five freely selectable riding modes for the first time: these are an ex works option and feature three different E-gas settings and with varying engine characteristics. Linked to this is Automatic Stability Control ASC with a special enduro configuration. If this option is chosen, BMW Motorrad ABS, ASC and—if installed—the semiactive suspension are all adapted to the respective profiles of these five modes. Semiactive suspension: BMW Motorrad Dynamic ESA for optimum riding dynamics in every situation as an ex works option. The new semiactive suspension BMW Motorrad Dynamic ESA (Electronic Suspension Adjustment) taps into a whole new range of possibilities as well as providing maximum riding safety and performance. Dynamic ESA monitors the vertical movement of front and rear wheel control as well as other parameters by means of a spring travel sensor in each position, and adapts the damping automatically to the situation depending on riding conditions and the manoeuvres being carried out. Damping adjustment at front and rear is effected by means of electrically controlled regulation valves. New chassis with tubular steel bridge frame and specially adapted wheel/tyre dimensions of 120/70 R19 at front and 170/60 R17 at rear as a world first. The chassis of the R 1200 GS uses a completely newly developed tubular all-steel bridge frame with a bolt-on rear frame. Along with the newly designed Telelever at the front and the EVO Paralever at the rear, this has resulted in a further significant increase in torsional stiffness and hence ride stability and steering precision. Optimised handling qualities are the result of refined master geometric chassis data, and a longer swingarm provides further improved traction—especially when riding over rough terrain. A globally unique feature of the new R 1200 GS are the tyres in the sizes 120/70 R19 at the front and 170/60 R17 at the rear, specially adapted to improve performance. Revised brake system with radially mounted Brembo Monobloc brake calipers and BMW Motorrad Integral ABS as standard. In line with the BMW Motorrad principle "Safety 360°" the new GS is also fitted as standard with the BMW Motorrad ABS, here in the part integral version. The first motorcycle in the world with LED main headlight including integrated daytime running light for even greater safety when riding during the day and at night as an ex works option. Even in its standard trim the new R 1200 GS has a main headlight with optimised light efficiency. In order to be seen even better during the day, BMW Motorrad also offers a daytime running light as an ex works option. For excellent road illumination and therefore even greater safety both day and night, an LED main headlight with integrated daytime running light is fitted in a motorcycle for the first time ever. It comprises innovative LED technology with a sophisticated cooling and decondensation concept. Electrical system with new vehicle power supply and Multi-Controller for the BMW Motorrad Navigator IV. The new R 1200 GS has the innovative new vehicle power system with altered function partitioning as already used in the 6-cylinder models K 1600 GT and GTL. As before, CAN bus (Controller Area Network) and LIN bus technology (Local Interconnect Network) enables significantly reduced wiring as compared to a conventional system. The previous central vehicle electronics has been partitioned into two separate control units. Aerodynamically optimised windshield with one-hand operation and optimum ergonomics. The newly developed windshield of the R 1200 GS offers further improved wind and weather protection while also reducing wind noise. Adjustment is simple: an easily accessible and ergonomically optimised selection wheel is operated using one hand. The new R 1200 GS has extended adjustment options for optimum seating comfort. The rider's seat can now be adjusted in height and tilt angle and the passenger seat can be shifted longitudinally to obtain the ideal distance between rider and passenger. The new handlebars can easily be turned upwards and, together with the optimised knee grip in the fuel tank area, they ensure an even better standing position for off-road riding. The improved knee grip can be clearly felt when seated, too. A high and a low seat, as well as an adjustable footrest system and adjustable foot controls, round off the program of special accessories offering individual adjustment facilities. An overview of highlights of the new BMW R 1200 GS. Basic engine with compact, light and yet rigidity-optimised crankshaft. Freely selectable riding modes "Rain", "Road", "Dynamic", "Enduro" and "Enduro Pro" with three different electromotive throttle actuator settings in conjunction with ASC (Automatic Stability Control), ABS and ASC settings for off-road riding as well as different mode-specific Dynamic ESA settings (option ex works). Optimised lightweight cardan shaft drive now running on the left-hand side. Newly developed and optimised Telelever at front and EVO Paralever at rear for an even more precise ride feel. Optimised seating width and position, and adjustable handlebars for even greater comfort. Optimised ground reach for rider (inner leg length). Tyre/wheel dimensions of 120/70 R19 at front and 170/60 R17 at rear as a world first, tailored specially to the R 1200 GS. Main headlight with optimised light efficiency and LED daytime running light (ex works option). World's first motorcycle with LED main headlight featuring integrated daytime running light (ex works option). BMW Motorrad Navigator IV (ex works option).